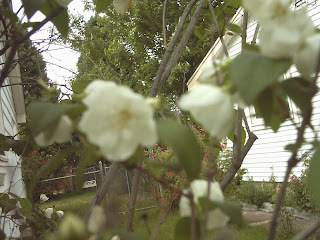 I have a mock orange that has a real history. It came from the neighbor who has had the parent plant for about 50 years. The plant he has came as a start from his mother in laws garden, and was gathered around the time she got married. In the late 1800's. This single flowered form has the most lovely fragrance, but I don't know enough about mock orange to find a name for this plant. It is planted in with roses and honey suckle and I think that must be what heaven smells like. I think I need to have a long talk with myself.. Happy Day of Explosive Celebrations!